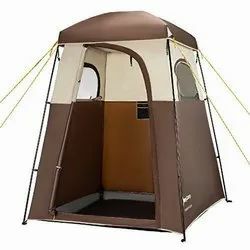 We are a leading Manufacturer of portable shelters and portable dressing room from Faridabad, India. SRG International is manufacturer, Supplier, Distributor of Portable Shelters. Our esteemed clients can avail from us qualitative Portable Shelters. Our bunk house are made from old sea container also knows as shipping container office. Our bunk house is just like shipping container use to dispatch goods from one place to another but internally design just like a home. Bunk house floor inside will have MDF finish and insulated in between. Bunk house poses resale value such outside wear and tear is very less and these bunk house.